We provide video subtitling services working to translate English to French and French to English. Video content is hugely beneficial for SEO and similarly, translations can open up your films to a global audience. Capital Captions work with a huge variety of different video formats, providing a range of different video to text services including french translation and subtitles. Capital Captions specialise in subtitling services for clients across the globe. 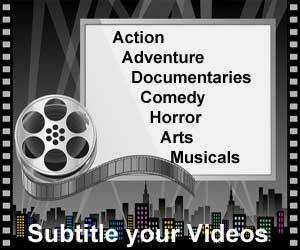 We offer fast, affordable French subtitling for English videos. Expert video translations aren’t easy to come by, but we have a streamlined process to make sure your subtitles are perfect every time. Firstly, a professional transcriptionist will use software to transcribe your video in English. Next, the script will be passed onto an expert subtitler. At this stage, they will accurately time the text, add descriptions and formatting, and work with subtitle placement as necessary. Next, a French translation template will be created where a professional French linguist will translate and localise the subtitles line by line, before passing back to an expert subtitler. Finally, the translated subtitles will pass through a quality control process, ensuring adequate reading speeds, line splits and other formatting. Once the French subtitles are perfect, they can be exported as sidecar subtitle files (soft coded) in a range of available formats including SRT, WebVTT, STL, TTML or DFXP. We can also hard code subtitles (burn permanently into the video). This is recommended use on social media or as forced subtitles for multilingual films. If you require French transcription, there are a number of options available. Our linguists are able to work with both audio and video, providing French time coded transcription, verbatim transcription, intelligent verbatim transcription, discourse analysis and audio description. In addition, we offer French logging of rushes for video production purposes and are happy to translate pre-existing documents and scripts without access to video if required. So there you have a it, a quick look at our French translation and subtitles services. If you would like to inquire about any of our translation or subtitling services, or are interested in getting a quote, contact us today for your free translation, subtitling or transcription quote.